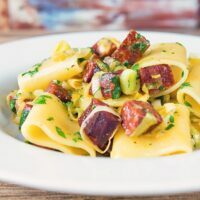 A simple pasta recipe is a great midweek dinner fall back and this salami and leek pasta ticks all of the boxes as well as being utterly delicious! 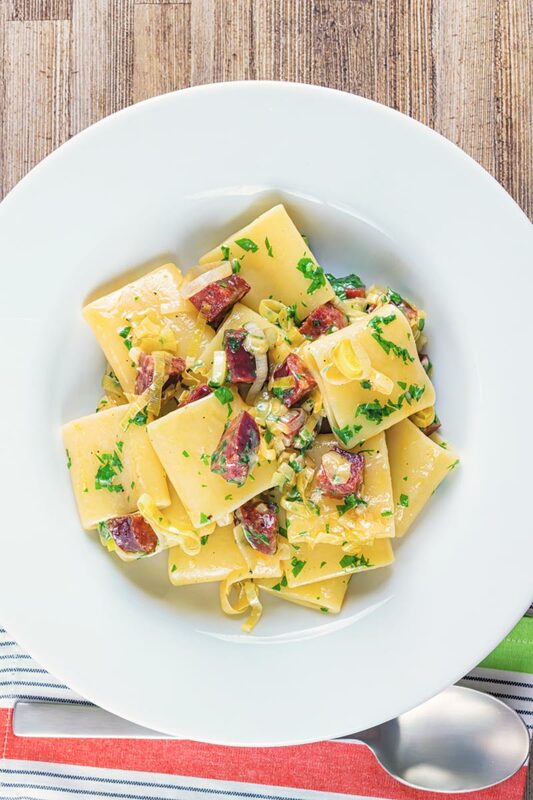 Quick and Simple Salami and Leek Pasta. 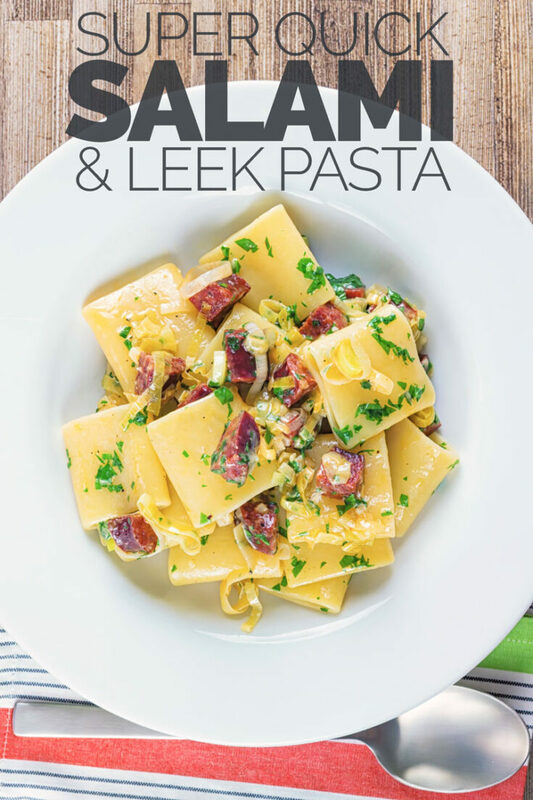 This wonderful salami and leek pasta recipe is the latest quick and simple pasta recipe here. If there is an ingredient better than pasta at being a midweek meal life saver I have no idea what it is. 10-12 minutes to cook and will work with practically any ingredient you have in your fridge or cupboard. 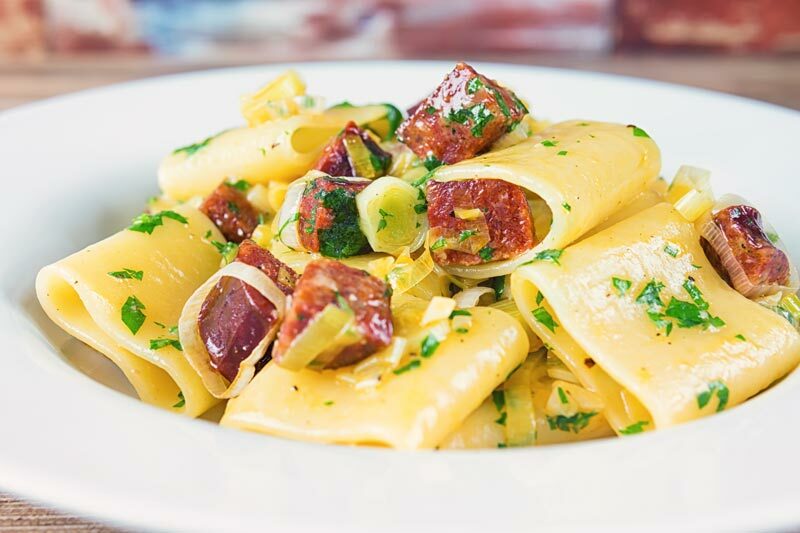 Here I use some wonderful wild boar salami in this quick pasta recipe as the main flavour base. But the type of salami is completely down to you, want something spicy then go for it, seriously this really just works! Salami is a fantastic ingredient it has boatloads of flavour, lasts forever and brightens up a host of dishes. It is also already cooked/preserved, so it adds little to no cooking time in recipes. In much the same way as my pepperoni and pea spaghetti recipe we start here by heating the salami to get it to release some of its fat content. This fat forms the base of the sauce and ties everything together. The second flavour in this simple leek pasta recipe is leek. I love leeks, hell I love all vegetables in the onion family, they form the base of so many global recipes. In fact, the very first meal I cooked for my wife way back in 2005 used leeks as a replacement for onions. Apparently, she did not like onions? The reality was far more complex than this and she no longer has a ‘beef’ against onions. But you will have to buy me a beer as that story is a doozie but far too long to get into here! Leeks, anyway, back to leeks. Here we soften the leeks slowly in the oils released from the salami. In many ways, the cooking process is similar to the one I used in the creamed leeks I made as a side for my fish cakes! As they cook they pick up the garlic and paprika flavours from the salami. Becoming a sweet and beautiful addition to this simple pasta dish. For this recipe I use paccheri pasta. This is a large but short open tube of pasta from Campania. It is pretty robust and solid and forms a hearty base for this simple pasta recipe. 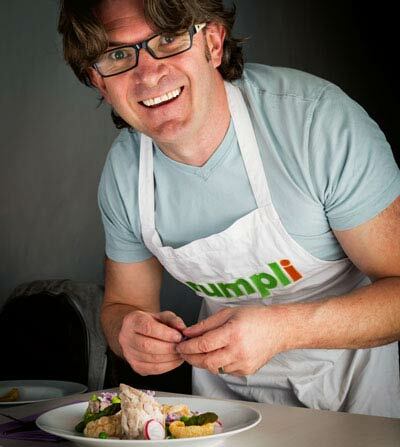 You can, of course, use something different although I would recommend something hearty and similar. Maybe a rigatoni as I used in my pasta pie or the perennially popular penne pasta as I used in my classic penne arrabiata recipe. For me the key to buying pasta is looking for the egg content. Generally speaking the higher the egg content the better the pasta. In fact here in Hungary, all pasta has the egg content published on the packet. An egg is the expensive part of pasta which in reality is nothing more than egg and flour. So expect to pay a little more for good quality pasta. Although you can make it at home. It is simple and fun, check out my homemade pasta recipe. Slice your salami into 1cm cubes and then place in a dry pan over a medium heat. Cook for 5 minutes until the salami begins to render out some oils. Whilst this is happening slice your leek into 3-4mm coins and dice your garlic. After 5 minutes add the garlic and the leeks to the pan and cook for 10 minutes. As your leeks sweat down cook your pasta as per the instructions over a rapid boil in salted water. Just before you drain the pasta add the butter and pepper to the pan with the salami and leeks and stir. Drain your pasta reserving some of the cooking liquid. Add the pasta to the pan and toss in the parmesan and then add enough of the cooking liquid to form a thick 'sauce'. Stir through the parsley just before serving. Pasta is always such a family friendly dinner but I love that you added a twist on flavors especially with adding leeks (one of my favorites too!). Looks incredible! Reading this reminds me that I need to cook with leeks more often. 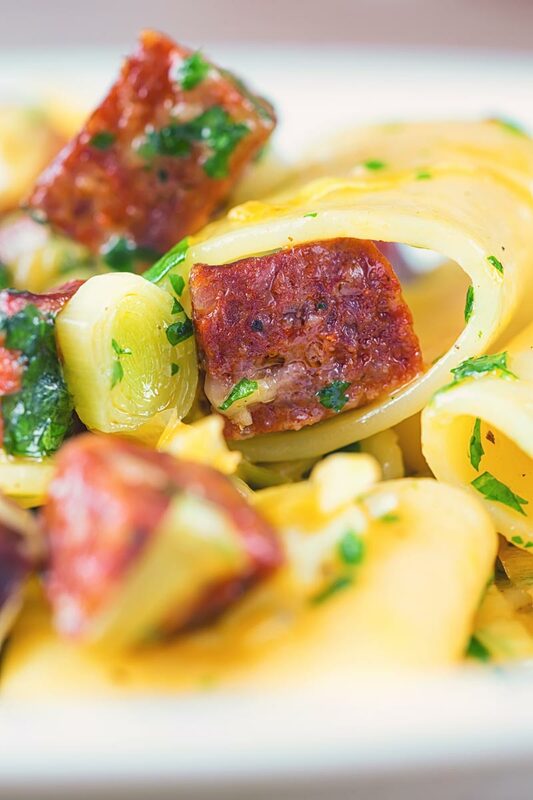 This salami and leek pasta would make the perfect weeknight meal when things are crazy busy. I love leeks they are fantastic at this time of year! I love salami but have never used it in pasta. What a great idea. And leeks are one of my favorite veggies/aromatics to use in cooking. So delicious! 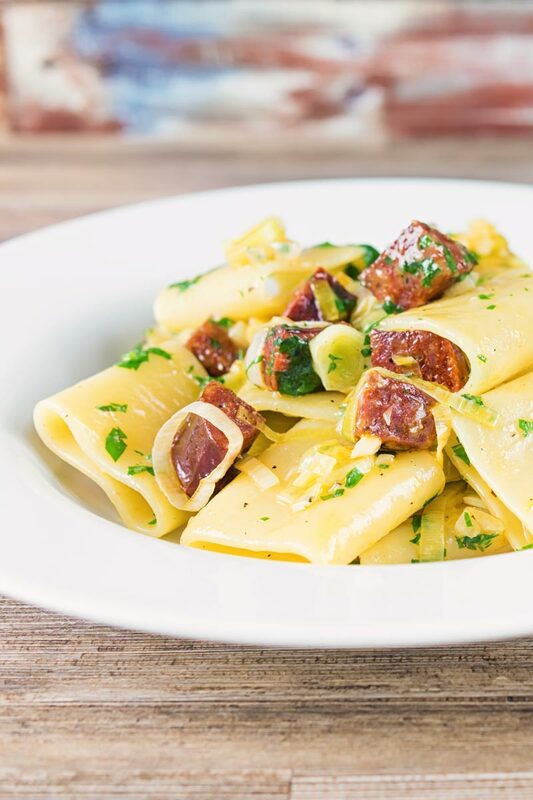 Salami is great for quick pasta dishes, allowing the fat to render down creates the most incredible complex flavoured coating in no time at all. Salami and leek aren’t two ingredients I’d ever think to pair together but looking at this dish, they so work together! Got to give this a try. It’s salami and onions really a preetty classic combination, but the leeks retain a slightly less sweet flavour than onions when cooked. I couldn’t agree more, its hard to beat pasta for a quick and hearty weeknight meal! Delicious pairing of leeks and salami in this, Brian!